(FLM) Power can reach 4W, 5W, and 7W. The temperature coefficient TCR (20 - 50) ppm, tolerance accuracy ±1%, ±2%, and ±5%, is used to improve the measurement accuracy. The resistance value is as low as 0.0002Ω, which is the first choice for high-end current sensing and sampling applications. Specially designed for applications requiring high power processing (LRN). The power is 4W and 7W. The ultra-low resistance ranges from 0.5mΩ to 30mΩ. There are various tolerance selection advantages (±1%, ±2%, ±5%) , size 4312, and 4320. To achieve compact size and miniaturization, design a smaller, lower cost, higher performance, high power circuit terminal product design. Designed specifically for high current applications LRS, the power can reach 3W, 5W, 6W, and 7W. The range of ultra-low resistance is from 0.1mΩ to 6mΩ. There are many options in selecting precision tolerances (±1%, ±2%, ±5%). Two types of chip dimensions are available: standard size 2512, 3920, and 5930; special size 3921, 4026, 4527, and 5931. Metal Glaze Impulse Resistor RI80 Series are able to absorb large amounts of energy at high voltage while remaining non-inductive. Ideal for: Capacitor crowbar circuits, Impulse voltage generators, Energy research, Pulse modulators, Radar Pulse-forming networks, High voltage snubber circuits, Arc furnace damping, X-ray/imaging equipment, and EMI/lightning supression. Designed for current detecting resistors in power electronic systems, the fully RoHS compliant CS series is suitable for a range of applications including the monitoring of power usage and battery life; and provision of output protection for power supplies; as well as for a range of consumer and automotive products such as satellite navigation, handheld PDAs and digital set-top boxes. The LRA Low Ohmic Resistor is designed for applications requiring the transfer of heat away from circuits and solder joints. Available in 0.5W, 1W, and 1.5W rating, the resistor is being specified for current sensing, feedback, current detective, supper low inductance, as well as surge and pulse applications. Developed for current sensing and shunt applications, Token's LRB Shunts of bare element open air resistors have a Ni-Cu alloys element, copper-clad steel leads and welded construction. Built-in stand-offs and standard spacings make for easy mounting. Customer can specify resistance range designed to satisfy challenging and specific technical requirements. The OAR devices with increased height improve cooling efficiency, and because many power supply designs are already tightly-packed at the PC board level, the additional height does not create any profile issues. 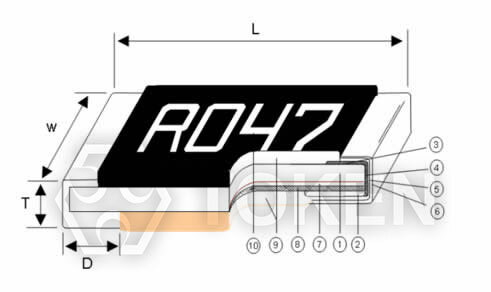 The OAR series resistors feature a reduced pitch, or spacing between the leads on the circuit board with a corresponding increase in the board mounted profile. A wide range of precision shunts, designed for use with kilowatt-hour meters and other high-current applications where a high level of accuracy is required, is now available from Token Electronics. Precision current shunts are low resistance resistors used to measure AC or DC electrical currents by the voltage drop those currents create across the resistance. Sometimes called an ammeter shunt, it is a type of current sensor. Metal Plate FLP shunts can withstand higher current load than traditional resistors and surface mount resistors. Its power can reach 3W~70W, temperature coefficient ±50ppm/ °C, ±100ppm/ °C, inductance is less than 10 nH, resistance is as low as 0.00005Ω, tolerance accuracy ±1%, ±2%, and ±5%, and overcurrent capacity can reach 100A~600A. Large Current Electron Beam Welding Precision Shunt is a new Bus-Bar Battery Shunt resistor that has rated voltage drop 75 mV capability with 1.5 mΩ to 0.075 mΩ. Specifically, it is possible to output 75 mV from the voltage terminal with a current from 50 A to 1000 A with precision ±0.5% and ±1% tolerance in option. Providing ultralow resistance values (to 0.01 ohm) for relatively high current requirements, new four-terminal cement filling resistors from Token combine the advantages of a Kelvin configuration with PC board mounting capability. The Kelvin (or four-terminal) configuration enables current to be applied through two opposite terminals and a sensing voltage to be measured across the other two terminals, eliminating the resistance and temperature coefficient of the terminals for a more accurate current measurement. Always preferred in current sense applications, Token's Kelvin LRD Four Lead Resistor range is available in the 1W, 3W, 5W, 7W and 10W packages, resistance values down to 0.001 ohm, with tolerances as tight as 0.50% and TCRs of 50ppm standard. Token's current sense LPS family for shunt-resistors is expected to gain wide acceptance in the worldwide market as a result of offering a variety of possibilities. The U-shaped semi-customized LPS family for direct board mounting is specified for current sensing, feedback, current detective, supper low inductance, as well as surge and pulse applications. The (FLU) offers a higher current load than conventional axial resistors and SMD resistors, with a wide range pitch of radial pins to choose from. Its rated power can be up to 1W ~7W, temperature coefficient as low as ±40ppm/°C, resistance tolerance accuracy ±1%, ±2%, and ±5%, resistance range as low as 0.1mΩ to 10mΩ. Token FLH devices always preferred in current sense applications, standard rated power 3W is available packages, resistance values down to 0.0003Ω, with tolerances as tight as ±1%, ±2%, and ±5% with low-inductance 10 nH. TCR is as low as ±20ppm/°C and ±50ppm/°C with high-impulse proprietary metal element that gives the device its extended power and temperature ratings. A homogenous film of metal alloy is deposited on a high grade ceramic body. After a helical groove has been cut in the resistive layer, tinned connecting wires of electrolytic copper are welded to the end-caps. Token has complete capability to develop specific reliability programs designed to customer requirements. Products equate Vishay, Ohmite, Caddock, IRC, EBG, KOA, Panasonic precision resistor with more competitive price and fast delivery. Equation: Pavg = IRMS2 × R; where Power (P), Current (I), Root Mean Square (RMS), Resistance (R). Allowing for transient or fault conditions and high ambient temperature if applicable, select the required power rating. For many current sense resistors, only the maximum temperature of the solder joints limits the power rating. Power rating is thus a function of the PCB layout design as well as of component selection. Determine the minimum suitable resistance value. This is the lowest value of peak sense voltage consistent with an acceptable signal to noise ratio, divided by the peak current to be measured. Establish the accuracy needed in terms of a tolerance on the value and of sensitivity to temperature. The latter factor is quoted as Temperature Coefficient of Resistance (TCR), defined as the value change in parts per million for a 1°C temperature rise. It is generally higher for low value resistors because the metallic leads or terminations, which have a very high TCR, make up a significant part of the total resistance value. To achieve acceptable accuracy it is normally necessary to make four-terminal (Kelvin) connections to the resistor. This means connecting the current carrying tracks and the voltage sense tracks directly to the component pads. Even when this is done, there is still some pad area and solder in series with the resistor, which may compromise the actual tolerance and TCR of the soldered part. For very high accuracy or very low values, a four-terminal resistor type is the best choice. Care must be taken when laying out a PCB if the stated performance of a sense resistor is to be achieved. The current carrying tracks should be as wide as possible, using multiple layers connected by many vias near the component pad. This also improves the heatsinking of the joints. The best way to make four-terminal connections to a two-terminal through-hole resistor is to use different sides of the PCB for the current and voltage connections. Failing this, current and voltage tracks should connect to opposite sides of the component pad. In order to avoid interference from stray magnetic fields, the loop area contained by the sense resistor, the voltage sense tracks and the sense circuit input should be minimised. This means keeping the sense circuitry as close as possible to the sense resistor and running the voltage sense tracks close to each other. Where transient or AC currents involving high frequencies are to be sensed, the self-inductance of the resistor must be minimised. Wirewound or spiralled film parts should be avoided, in favour of bulk metal or low value chips. When using a metallic element shunt with high heat dissipation and low sense voltage, consideration may need to be given to thermoelectric voltages. The junction between a metallic resistance element and metal terminations acts as a thermocouple, generating a voltage proportional to the temperature difference across it. A leaded metallic element sense resistor is therefore like two thermocouples back to back. This means that, if the temperature differences across both junctions are equal, the error voltage is cancelled out. This is achieved by making the design thermally symmetrical, namely, by presenting both terminals with similar heatsinking and by keeping any other heat sources thermally distant. Using a wider side as the connection in the mounting plate, the wide terminal current sense chip reinforces the solder joint and is reliably held to achieve higher power ratings. The wide-terminal current sensor saves space and reduces the amount of resistors in high-density board designs due to its ideal structure to suppress heat generation. Based on thick film technology, the parasitic inductance of these chips is much lower than that of wire wound and leaded components. Token's thick film Token CS low ohmic current sense chip resistors are low cost, capable of providing low TCR down to ±100ppm/°C, resistance values as low as 1mΩ, and power consumption up to 3 watts. Metal foil current sense resistors made of manganese-copper alloy were developed with the substrate to provide better heat dissipation and a wider resistance range of up to 700mΩ. Metal foil The CSM series has a lower EMF under temperature variations. μ0.03μV/°C is more likely to withstand harsh conditions. In the metal foil type, the TCR ranges from 50 to 100 ppm, the power is up to 5W, and the resistance is as low as 1mΩ. A simple structure without multiple cuts, metal plate current sense resistors provide low TCR down to ±50ppm/°C, Up to 5W rated power, high frequency performance and low resistance down to 0.1mΩ. For accurate measurement of circuit design, lower power consumption, higher accuracy and smaller space requirements are important features of electronic control units. In order to minimize power consumption, it is necessary to measure the large current across the (Rsense) resistor, and the high-side current sense amplifier IC must accurately monitor the current. A four-terminal current-sense resistor that separates the current transfer from the voltage-sensing terminal, from the ideal Kelvin configuration, improves voltage and current measurement accuracy. They also improve interference and thermoelectric effects in higher power applications. Download Design & Selection in PDF file. An unencapsulated resistor chip on which bead-type leads terminate on one face to permit "flip" (face down) mounting of the resistor chip by contact of the leads with interconnective circuitry. The maximum temperature measured on the resistor due to both internal heating and the ambient operating temperature. Components designed with "lower than standard heights", to save space and allow clearance when mounted on PCBs. The maximum specified voltage that may be applied across a resistor. Parts per million. The terminology used when describing the temperature coefficient. The process of printing a network pattern of thick-film ink or paste onto a substrate by means of a squeegee applied to a photo-etched wire-mesh "silk screen" or metal mask. Current shunt resistors are precision low resistance resistors used to measure AC or DC electrical currents by the voltage drop those currents create across the resistance. Sometimes called an ammeter shunt, it is a type of current sensor. Products that look like resistors, but actually have no resistance (very very low resistance) and instead perform as jumpers. Due to the increase in sales of notebook PCs, the demand for the DC/DC converter has shown rapid growth because of its high-energy conversion efficiency, and its precise current-limiting capability. However, to ensure the performance of the multiple output DC/DC converter, the current limiting voltage must be detected precisely to protect an expensive notebook PC from an overload, which is generally due to shorts within the capacitors used in these devices. For high-energy conversion efficiency various control ICs have been developed that utilize resistive components. To achieve the perfect cutoff mode of the DC load current at the programmed current-limiting voltage of the control IC, a very stable and accurate sense resistor with the following characteristics is required for precise voltage comparison. Very Low Ohmic Value should be below 25mΩ for minimizing power consumption at the current sensing resistor. Tight Tolerance must be ±1% or tighter for maximizing the current supply within the limit of acceptable current. Low TCR is required for current sensing across the ambient temperature range of 0°C to 60°C. Low Thermal EMF for an accurate comparison between the programmed current-limiting voltage of the control IC and the detected voltage. Furthermore, the self-inductance should be for high frequency applications. Recommended types are general purpose current sensing products or a flame retardant type. 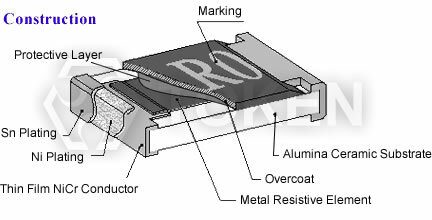 High precision resistors used for current sensing are usually low ohmic value devices suitable for four terminal connection. To use a four terminal resistor, we force a current from Terminal 1 to Terminal 2. It's current, so the unknown resistances attached to Terminal 1 and Terminal 2 don't affect the amount of the current. The same number of electrons per second flow through from T1 to T2, regardless of the resistance. A voltmeter measures the resulting voltage drop across the ultra-precise resistor, measuring through the unknown resistors attached to Terminal 3 and Terminal 4. The voltmeter's input impedance is very, very high compared to the unknown resistors, so the unknown resistors have essentially zero effect (typically less than 0.1 parts-per-million). So the current flows through the 0.100 ohm resistor, unaffected by the unknown resistors, and we measure the voltage across the 0.100 ohm resistor, unaffected by the unknown resistors. And that's how a 4-terminal resistor works! What is a "Current Sense"? Current sensing products are the newest and fastest growing resistive products in the industry today. As with most passive products, the majority of new designs are surface mount. These resistors are used to monitor the current in a circuit and translate the amount of current in that circuit into a voltage that can be easily measured and monitored. Download Terminology & Glossary in PDF file. Token's TCS and CS Series unique form factor provides automotive designers with several advantages. Both TCS and CS Series are ideal for applications involving window lift motors, fuel pump systems, seat belt pretensioners, and pulsewidth modulator feedback. The wider resistive element and lower resistance enables higher current to pass through the device. Token's LRC ultra low ohmic metal strip chip series provides the inherent ability to flex slightly and offers stress relief during extreme temperature cycling on typical or metal substrates. This LRC series is suitable for switch power supply applications (DC-DC Converter, Charger, Adaptor) and power management of monitor. The open air design of bare element resistor LRA and LRB Series provide a far cooler operation by allowing more air flow under the resistive element to keep excess heat from being transmitted to the PC board. They are suitable for high power AC/DC detection of power supply circuit. Token axial moulded BWL series provides power rating up to 10 watts and lower resistance 0.005Ω, is ideal for all types of current sensing applications including switching and linear power supplies, instruments and power amplifiers. As the world becomes more and more technology-driven, the uses for current sensing components will continue to increase. The need for even lower resistance value ranges is already becoming evident, as is the need for these resistors to handle more power. The industry-wide trend is the emergence of smaller and smaller products. Token Electronics offers a wide variety of current sensing products from the industry to military standards, such as current sense in Thin-Film / Thick-Film Technology, Bare Element Resistors, and Open Air Shunts. This enables Token to present an astounding number of possible solutions for any circuit design needs. Token standard current sensing components can be replacement for Vishay, IRC, Ohmite, KOA, Yageo devices with fast delivery and more competitive price. Contact us with your specific needs. Download General Info. of Current Sense in PDF file. Download Token Current Sensing Product Catalogue: PDF file (1.21MB).